Interacoustics AA222 Diagnostic Audiometer/Tympanometer w/ NEW Calibration Cert. Qualitone CD2, Portable 2 Channel Audiometer with Current Calibration Cert. 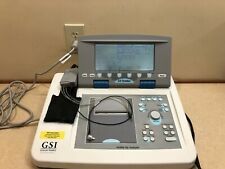 GSI 16 Audiometer Patient Response Switch, NEW!! Qualitone AAJ, Portable 2 Channel Audiometer with Current Calibration Cert. Monitor Instr. MI5000B w/ Acoustic Ear Audiometer w Current Calibration Cert. Monitor Instruments MI5000B Automatic Audiometer w Current Calibration Cert. Audioscan Verifit Hearing Aid Analyzer Complete w/ Real-ear & Calibration Cert. Audiometer Patient Response Switch (Fits Most Audiometers) NEW!! Maico MA40 Audiometer w/Headphones, Inserts, and Bone, Current Calibration Cert. Maico MA40 Audiometer w/Headphones, and Bone, with Current Calibration Cert.